Dakota Weiss‘ Sunset Strip restaurant Estrella is an ode to Laurel Canyon’s mythical and bygone era, when its heroes (“Mama” Cass Elliot, Frank Zappa, Joni Mitchell, Neil Young, etc.) populated the bohemian neighborhood’s hilly terrain and made sweet music together. The name of the new spot is actually a reference to a character in Mitchell’s song “Ladies of the Canyon,” and the cocktail list devised by Gia St. George makes plenty of references to the singer’s life. With that thematic backdrop in place, it’s not surprising that granola would pop up on the menu. And it does so in an unexpected place: dinner. 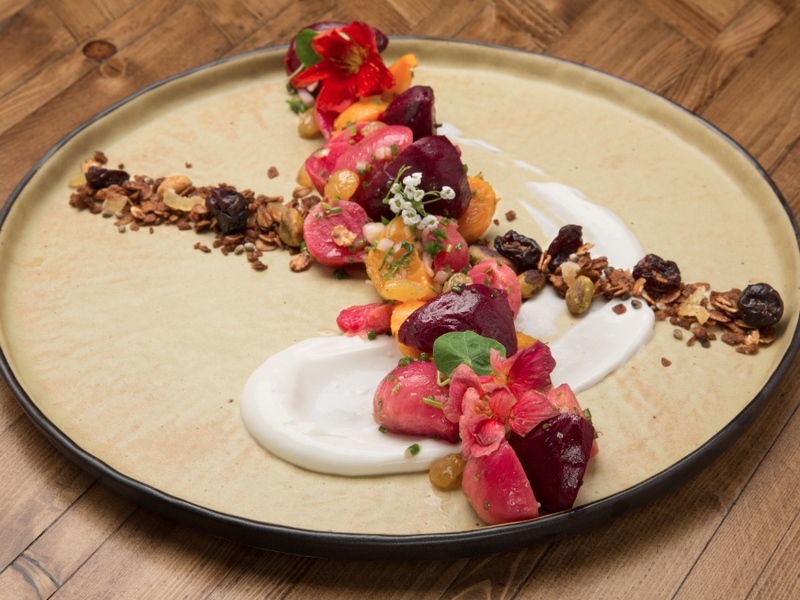 Weiss’ Roasted Baby Beets is a prettily composed plate of its namesake, goat’s milk sour cream, nasturtium flowers, and, yeah, pistachio granola. “I have had this dish in mind for almost one and a half years. Beets have become such a loved-by-all vegetable, and especially for salads, that it’s almost expected have a beet salad on all menus,” says Weiss, who wanted to take the “classic pairing” of the beets, arugula, and goat cheese to an interesting, unique place. “The granola came about because I wanted a really great texture for the dish that would be able to add several flavor profiles” she says, noting that the traditional breakfast bowl staple can be sweet, nutty, and spicy all at once. And Weiss doesn’t shy away from the sweetness; instead, she plays with it, even adding pickled golden raisins, which bring a coupling element of sourness, too. To that effect, there’s also the light funk of the sour cream, which Weiss has been having a lot of fun making from scratch (along with her own creme fraiche, yogurts, and farm cheeses) through a three-day process that took her seven tries to nail. The balance it lends to the dish makes it worth the effort for the chef. “I think the sourness and savory flavor from the goat’s milk sour cream and the earthiness from the beets allow that granola to have a bit more sweetness,” she says. Texture-wise, there’s also a lot going on, including the crunch of the granola, the chewiness of the raisins, and the firmness of the beets. The result is harmonious–perhaps even as harmonious as a Crosby, Stills, Nash, and Young tune.